Okay, The news is in. On Saturday February 25th Geoff And Georgi had an amazing, precious little boy. Charles Llewellyn Anderson.Georgi is doing an amazing job. Poor Charlie has had a few set backs with his health and Georgi is being a trouper. I am a very proud Nanny and David is as proud a Poppy as I.
Oh and I did get a layout done last week but didn't get around to putting it up cause I was busy thinking about my little Charlie. 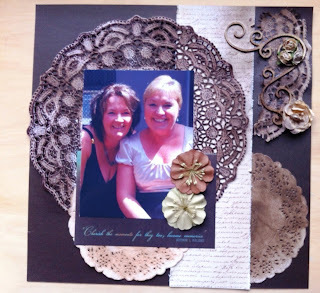 This layout is of Donna and myself at Geoff & Georgi's engagement party in February 2011 at the Lord of the Isles. The comment if you can't read it say's "Cherish the moments for they to, become memories".